Along with Sir Austen Chamberlain, Evanston’s own Charles Gates Dawes was co-recipient of the 1925 Nobel Peace Prize from the Nobel Committee (awarded in 1926). Dawes received the award for his work as chair of the committee that created a plan (the “Dawes Plan”) to stabilize the German economy and organize a method of debt repayment to the Allied nations. After World War I, the Treaty of Versailles outlined Germany’s payment of reparations, amounting to $269 billion dollars. In 1921, the amount was reduced slightly, but by 1922, Germany defaulted on its payments, its economy nearly in collapse. In response, in January 1923, French and Belgian troops occupied an area of Germany’s Ruhr Valley. Ultimately, 130 German civilians were killed by occupation troops, and the country fell into further disorder, as it was destabilized by strikes, civil unrest and a state of emergency. Meanwhile, acts of sabotage against the occupying troops were underway. The idea of another war seemed unbearable to a world barely recovered from the four long bloody years of conflict that had only ceased with the Armistice of 1918. It was in response to this crisis that the Dawes Committee sought a solution. The Dawes Plan, adopted in April 1924, ordered the evacuation of the occupation troops, the reorganization of the Reichsbank, and the loaning of funds to Germany from U.S. banks under the supervision of the U.S. State Department. The immediate crisis was averted. The plan worked. Occupation troops withdrew in August of 1925 and the German economy seemed to rebound. And it was for this reason–“ for his masterly handling of this crucial international problem”— that Dawes was seen as helping to ensure peace and awarded the Nobel Peace Prize. Still, some critics charge that, ultimately, the Dawes Plan did not stabilize Germany. Once the world plummeted into depression after the 1929 crash, the German economy, now strongly tied to the U.S. economy (and the many bankers whose interests were represented in the economic plans), plunged headfirst into financial chaos, and soon Adolf Hitler, who began his political rise in the early 1920s, would take the reigns of power. To be certain, the Dawes Plan was not a bulwark against totalitarianism; nor was it a solution to economic and social instability in a world that had been severely weakened and disorganized by global war and financial depression. It was an effort to respond to an immediate conflict, to avoid war. And, perhaps, it was the making of such an effort that the Nobel Institute sought to recognize. Dawes donated his portion of the prize money ($15,775) to the Walter Hines Page School of International Relations at Johns Hopkins University. He donated his medal to the Forest Lawn Museum in Glendale, Ca. His award certificate, (pictured above), is part of the collection of the Evanston History Center, housed in the Charles Gates Dawes House, a National Historic Landmark, in Evanston, IL. “Dawes Nobel Prize a Gift to School.” New York Times. January 16, 1927. Elson, Henry William. Modern Times and the Living Past. New York: American Book Company, 1921. Nobel Lectures, Peace 1901-1925, Editor Frederick W. Haberman, Elsevier Publishing Company, Amsterdam, 1972. “World Statesmen Get Nobel Prizes.” New York Times. December 11, 1926. 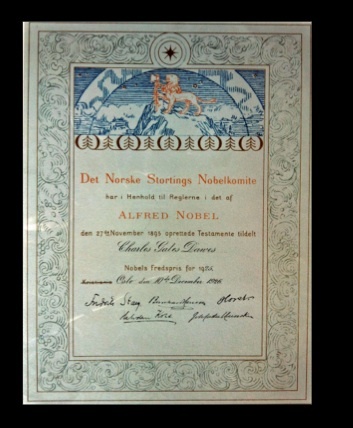 Nobel Lectures, Peace, 1901-1925. Frederick W. Haberman, Editor. Amsterdam: Elsevier Publishing Co., 1972.